Did anyone else finish “Variation on a Theme” with an urge to sing Ding dong ding dong ding? In my head the lovely Jean Simmons, her short locks loosened on her forehead and her Salvation Army uniform dangerously unbuttoned, has flung her arms around this poem, as unlikely an attachment as hers to Marlon Brando. But wait, another artist has boarded this train of associations–illustrator N.C. Wyeth. The particular Wyeth painting the poem reminds me of is The Giant. Wyeth’s towering figure, seemingly grown out of the clouds, could be a visual version of the shape-shifting in Levertov’s poem. Along with an atmospheric freshness of sky, air light, the poem and the painting share a Romantic delight in dramatic events, the sublime and mythology. This ordaining gives her power. The poem ends with her unshakeable confidence that the task that has been set before her can be accomplished. 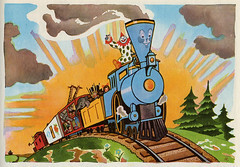 Compare her mantra of I can with that of The Little Engine That Could. He barely gets himself up the hill with I think I can. Her bold and strong I can countenances no doubt. Does her assuredness come from beyond herself, or has it been there all along, needing only to be awakened? Regardless, there’s a clear sense that the task for which she is commissioned is something difficult, something she previously didn’t think she could do. What separates this speaker from an athlete in a Nike commercial or anyone visualizing success in order to increase sales, run faster, plank longer, lose weight, parkour, stop smoking or swallow slugs is that the speakers’ unnamed task carries moral weight. She’s granted more than fearlessness and strength. She’s been given or has found courage. This train of thought left me counting the number of times I’ve been called on to show courage. And whether I’ve responded I can or I can’t or Not now or Please don’t make me do that. Which is a lot of boxcars to get me to the junction of this poem and the Underground Railroad. Recently I took a walking tour of Detroit. 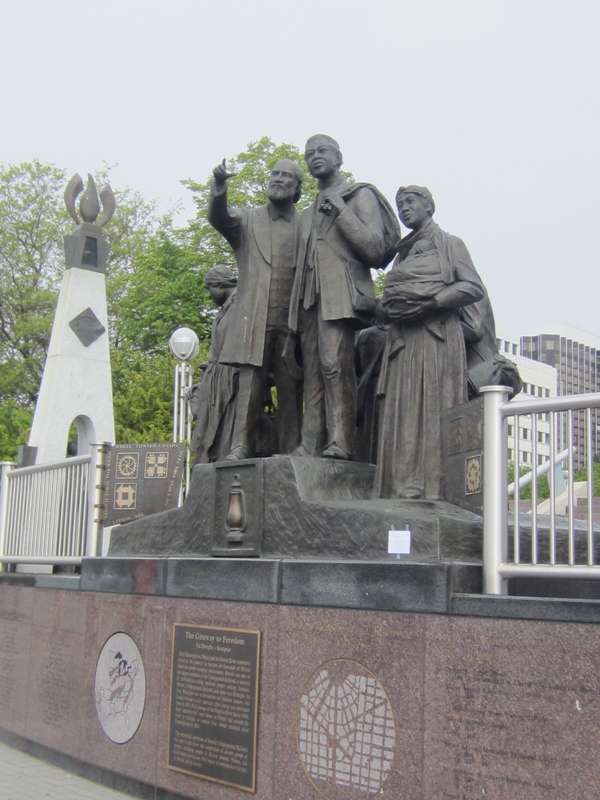 Our group stopped at Hart Plaza on the Detroit River to look at “Gateway to Freedom,” a statue commemorating Detroit’s role in the Underground Railroad. 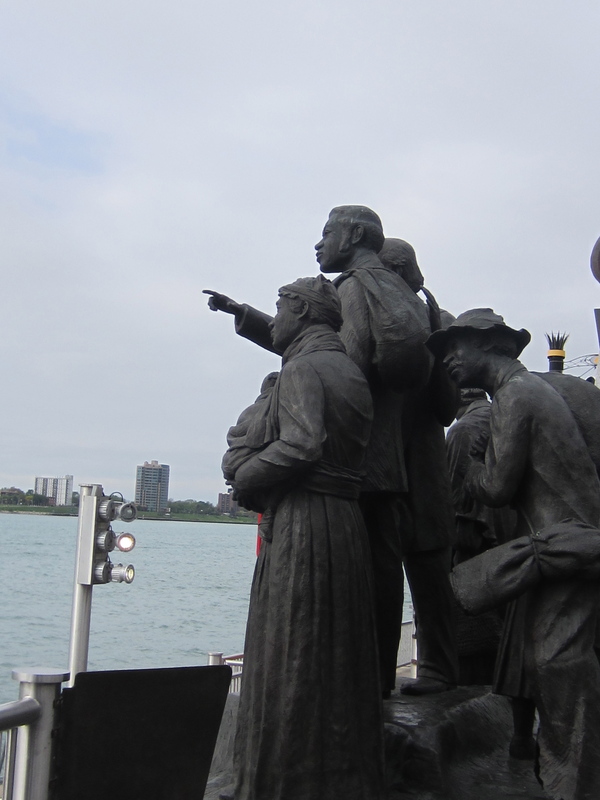 The figures in the sculpture look across the river to Canada, where a sister statue, “Tower of Freedom,” has been erected. Before the Civil War, six or seven different routes of the railroad funneled through Detroit, transporting somewhere between 40,000 to 100,000 slaves to Canada. Arriving in Detroit, fugitives (refugees might be a better word) hid in church cellars and barns. At night they took canoes to cross the river to Windsor. Looking up at the statue, I thought about the moment a man or woman who had known only a life of slavery decided to walk thousands of miles on foot, traveling in the dark, knocking at strangers’ doors, crossing rivers, hiding from slave catchers, and risking hunger, drowning, capture and death. I’m in awe of the courage such a journey demanded of the travelers and those who assisted. Of all the poems in my backpack, “Variation on a Theme” called out the loudest for a place in the city that was the last stop to freedom. One last thing: can anyone help me with the title of this poem? 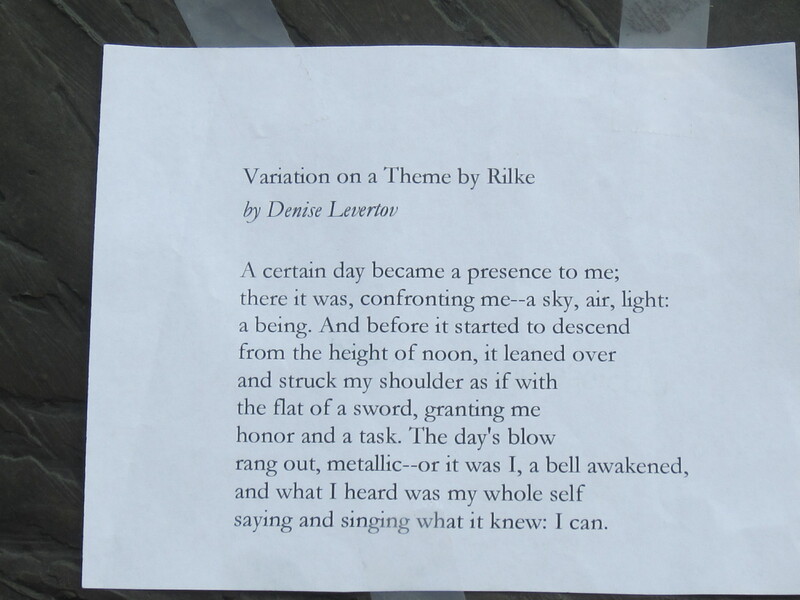 What theme of Rilke’s is this a variation of?